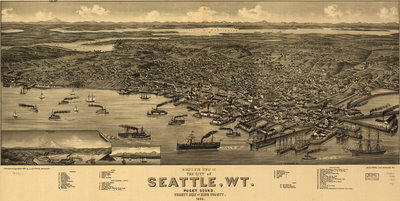 Beck & Pauli’s birdseye map of Seattle, Washington Territory, in 1884. This is somewhat later in the year than the “Whitney” version of this map (see our #4336) and show more property developments and more coverage on the east side of town. 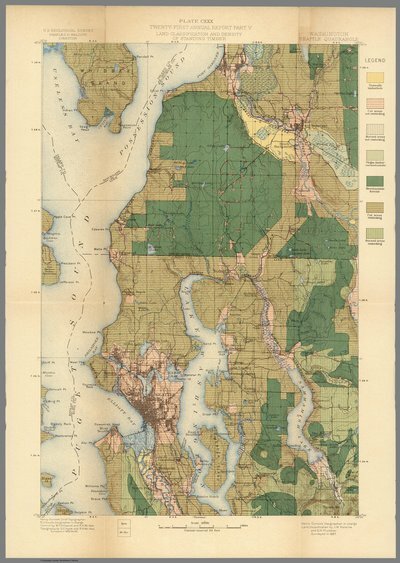 The smaller scale inset map of western Washington state is eliminated. Map in color by area. 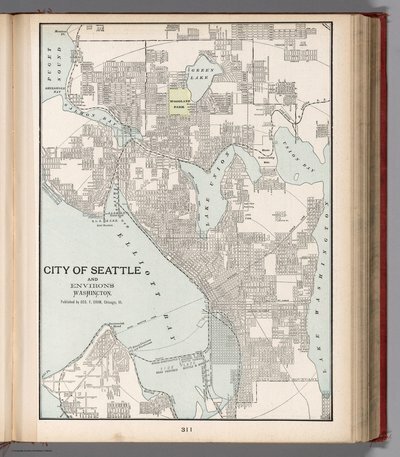 With two inset maps of the environs of Seattle. This is a subdivision map showing the early expansion of the city. 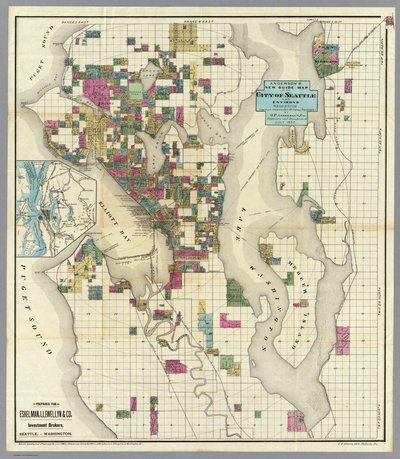 Streeter: “This map shows Seattle before the boom of the nineties, with the original subdivisions and ownerships named and blocked out in different colors.” With the Union Pacific logo in the lower left (compare to the Whitney “Astoria” map). Map is folded into untitled dark brown cloth covers 16x10. 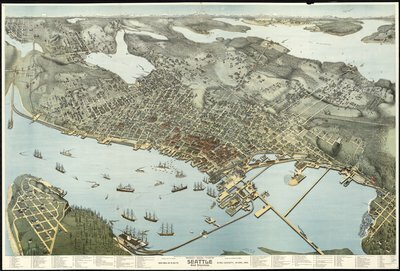 Baker’s birdseye map of Seattle in 1891. Perspective map not drawn to scale. Subtitle indicates it was made “Eighteen months after the Great Fire”. Color. Relief shown in contours. 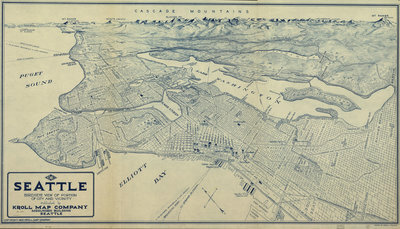 Topography surveyed 1893-94-95. Land classification surveyed 1897. Color map. Shows city blocks, roads, railroads, ferries, public buildings, parks, etc. Relief shown by hachures. 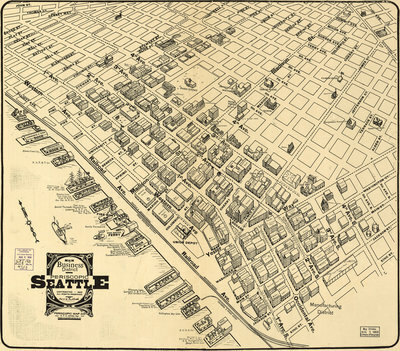 Tulloch’s birdseye map of the Seattle Business District in 1903. 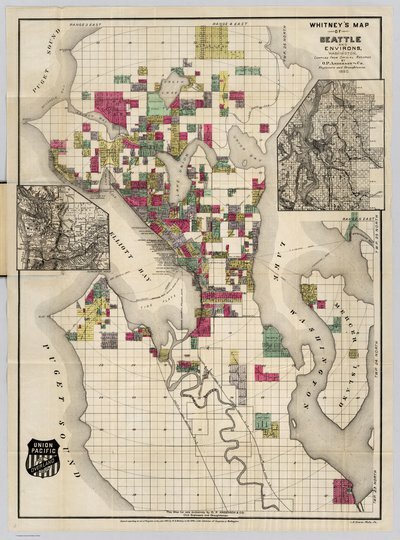 Note the additional neighborhoods near Fort Lawton that appear to be plats in the tide flats that were never built. 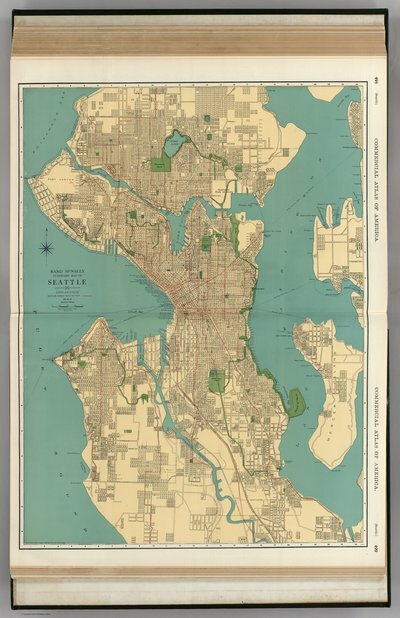 A unique and arresting birdseye map of Seattle, Washington. Rendered with a draughtsmanlike aesthetic in blue lines on white. 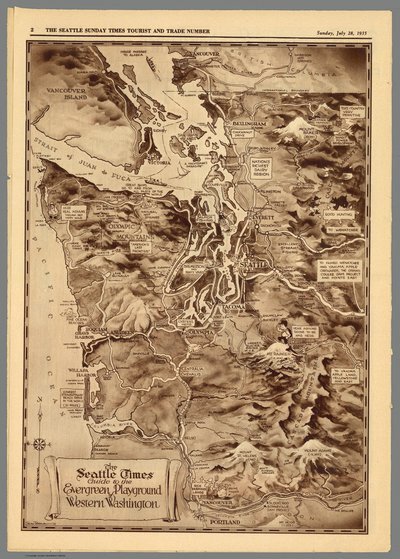 Pictorial map of Western Washington, by parker McAllister. Published in Sunday issue of Seattle Times. Covers Vancouver, B.C. in the north to Portland, Oregon in the south. 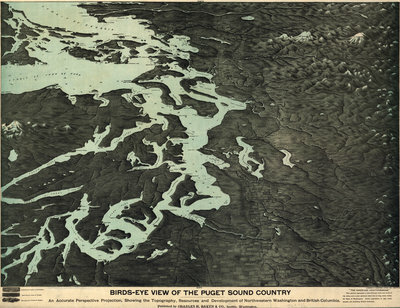 Shows roads, rivers, mountains, place names, cartoon images and text boxes. Relief shown by shadings and spot heights.